Here at Bullet Garage Doors, we take pride in the way that we provide our customers with garage doors of the very highest quality. We have over fifteen years of experience and expertise in supplying, installing, and carrying out repairs on garage doors. As a result, we’ve become the first choice for many people across Leighton Buzzard and the surrounding areas. We believe in looking after our customers every step of the way, which is why we offer a complete and all-round service each and every time. When you choose Bullet Garage Doors for work on your garage door, there are certain assurances we can provide you with. We’ll organise a one on one consultation where we will assess your garage, take measurements, and offer you the details of the service we’ll offer you. You’ll be able to select the colour, style, and material of your garage door if it’s a new one you require; if you’re in need of a repair, we can provide you with all of the information you need to make an informed decision. Our workers will always check that you’re completely satisfied with your choices before proceeding with any work; the final say is always in your hands. As we’ve mentioned previously, we don’t just install new garage doors. We also offer garage door repairs throughout Leighton Buzzard and the wider Bedfordshire area. If a repair is what you require, then we’ll be sure to assist you as much as we can. As an extremely reliable company, we’re trusted to always provide accurate information and helpful advice. For more on what our previous customers have had to say, check out our testimonials and our Checkatrade profile. As we’re based in Dunstable, we’re in a great location to serve people living near Leighton Buzzard. As you can see from the map below, we’re just over twenty minutes away via the A505 and the A5. Give us a call, and we’ll be able to come and see you shortly! 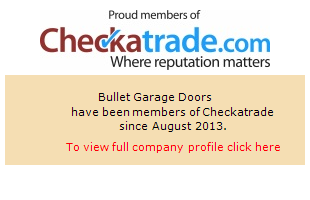 In summary, if you require a new garage door or a garage door repairs service, get in touch with Bullet Garage Doors. For more about our services or to book an appointment, call us on 01525 620025, or fill out our online contact form. We look forward to hearing from you!